Heavy snow from the Mount Shasta area is spilling in the southern Shasta Valley this evening and is expected to continue overnight. The combination of heavy snow and wind there will create winter storms warning conditions. Along highway 97 northeast of there into the Grass Lake area a winter weather advisory has been issued to address the combination of snow and wind there, in addition to the slight chance of freezing rain there Wednesday morning. Travel could be very difficult to impossible. The hazardous conditions could impact the morning or evening commute. Gusty winds could bring down tree branches and cause power outages. A brief period of freezing rain is possible Wednesday morning which would increase the possibility of damage to trees and powerlines and could ice roadways. Heavy snow, and blowing snow expected. Total snow accumulations of 10 to 14 inches expected in the Warning Area with 5 to 10 inches in the Advisory area. Winds gusting as high as 50 mph will create areas of blowing and drifting snow with occasional whiteout conditions. There is a slight chance for freezing rain Wednesday morning. 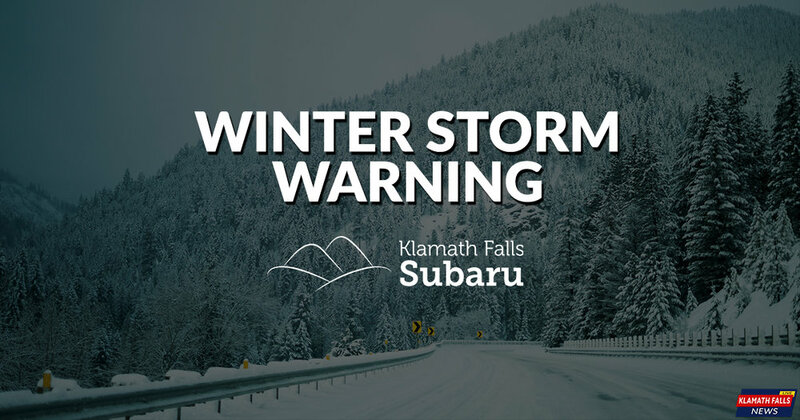 Warning area for much of Klamath County and Western Lake County to include Highway 97 from Modoc Point northward to Crescent and Highway 140 at Bly Mountain. Advisory Area for Klamath Falls, Lakeview, Paisley, including Highway 31. Until 10 AM PST Wednesday.